﻿Since its debut at the Lillehammer 1994 Winter Games, the Paralympic version of ice hockey has quickly become one of the largest attractions for spectators. It is fast-paced, highly physical and played by male and female athletes. At a league level in the UK the sport is played by both Disabled and Able Bodied players on the same team. At an international Paralympic level, it is played by players with a physical impairment in the lower part of the body. In 2016, the sport was renamed and rebranded from IPC Ice Sledge Hockey to Para Ice Hockey. Double-blade sledges that allow the puck to pass underneath replace skates, and the players use sticks with a spike-end and a blade-end. Therefore, with a quick flip of the wrist, the players are able to propel themselves using the spikes and then play the puck using the blade-end of the sticks. A player may use two sticks with blades in order to facilitate stick handling and ambidextrous shooting. Para Ice Hockey games consist of three 15-minute periods. 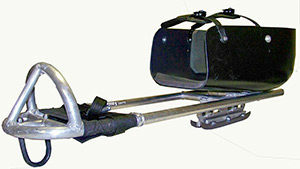 Sledge: Made of aluminium or steel, sledges are 0.6m to 1.2m in length with a curved front end and one of two different seating systems (known as Buckets). The sledge is set on two blades, which are usually made of tempered steel and are each 3 mm thick. The puck must be able to pass underneath the sledge. The height of the main frame is between 8.5cm to 9.5cm above the ice. 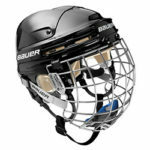 Straps secure a player into the Bucket and straps across the player’s feet or ankles anchor the player in to the sledge. Stick: In Para ice hockey, players use two sticks with a hooked wooden blade at one end (for puck handling and ambidextrous shooting) and a pick at the other end. Each stick has a maximum length of 1m and is made of wood, plastic or aluminium/titanium. The picks end of the stick must not damage the ice surface or inadvertently puncture or slash other players. Puck: Made of vulcanized rubber, the puck is 2.54cm thick, with a diameter of 7.62cm and weighs 156 to 170 grams. Pucks are frozen before games, to help them travel across the ice surface. Top players can hit the puck at speeds of up to 100 km/h. A direct descendant of ice hockey, Para Ice Hockey was invented at a rehabilitation centre in Stockholm, Sweden, during the early 1960’s by a group of Swedes who, despite their physical impairment, wanted to continue playing hockey. The men modified a metal frame sled, or sledge, with two regular-sized ice hockey skate blades that allowed the puck to pass underneath. Using round poles with bike handles for sticks, the men played without any goaltenders on a lake south of Stockholm. During the 1970’s, teams from these two countries played once or twice a year. Several other countries began to establish teams, including Great Britain (1981), Canada (1982), USA (1990), Estonia and Japan (1993).